Insomnia Program and author of No More Sleepless Nights. to "Sample". 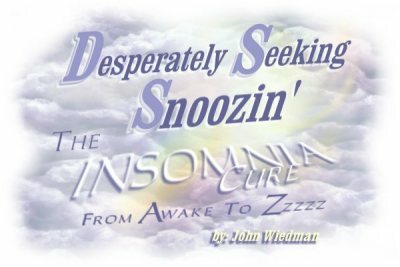 To order the book, Desperatately Seeking Snoozin', go to "Purchase"
"I believe what makes this book special and more useful than other books is that John Weidman has identified the key discovery to falling asleep and staying asleep without use of drugs. Although I was skeptical about any "cure" for insomnia, this book has allowed me to overcome my 20 plus years of insomnia. I am so grateful John has written this book...Buying this book was perhaps the best investment I have ever made. I would gladly have paid hundreds or even thousands of dollars to cure my insomnia. I recommend this book to anyone suffering from insomnia." "John, if you never sell another book, you have been a success because you have changed my life and I am worth it!!!" -Virginia L. Biasotto, Chairman/person of the board of Reading ASSIST Institute, Wilmington, DE. "Now I am writing you to say, Thank you. Your book is the first healthy thing I have ever done to undo this affliction.... Slept from 1:30 until 6 after the previous night of 8 hours. Felt great today. I can't tell you how good I feel that this has been done drug free. "-Virginia L. Biasotto, Chairman/person of the board of Reading ASSIST Institute, Wilmington, DE. J. Baldwin Smith, III, M.D.